Combine all the ingredients in a small bowl and whisk well. 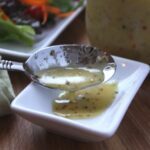 Pour the finished dressing into a glass jar or bottle. This will keep well in the refrigerator for a week or two.